I owe a huge hug of gratitude to Kathleen at Grosgrain Fabulous. She posted 30 days of sweater embellishments on her blog. In those tutorials she took the most ho-hum sweaters from Goodwill and turned them into Cinderella-worthy tops. And now, on to the transformation! 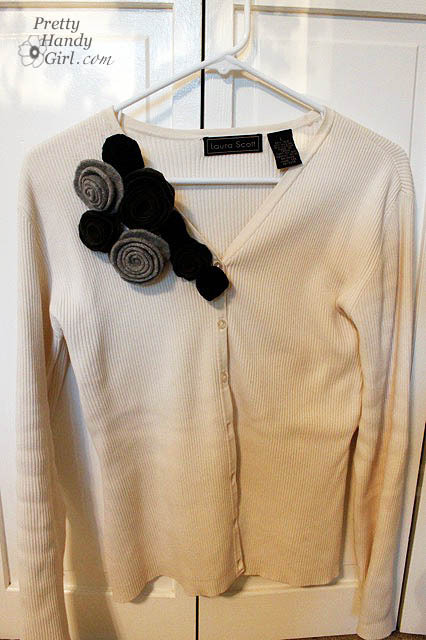 I started by resizing the sweater per Kathleen’s tutorial HERE. Put the sweater on inside out and pin excess starting under the arm and ending at the hip. Carefully (very carefully unless you want to become a pin cushion) remove the sweater. Stitch along the pinned line. Put the sweater back on to check the fit. Next, grab some of those adorable felt roses we made the other day. (Rose tutorial HERE) Lay them onto the sweater and play with the placements. When you are happy with the roses, pin them on with safety pins. Sew on the roses with needle and thread. And remove the safety pin once the rose is secure. That’s it. Beautiful new cardigan from a $3 Goodwill sweater! I added a knit belt that I sewed some roses and a hook and eye clasp on. Poor Buddy (aka Pretty Handy Dog), he’s not so sure about me leaving for Blissdom tomorrow. Check out some more Goodwill and thrift store fashionista outfits at Balancing Beauty and Bedlam. So cute! I write a blog for Goodwill of Upstate/Midlands SC and I love to see things like this! You did a great job! Looks great! Thanks for the idea! Hello there and HELP! I crochet a cute sleeveless sweater and the arm hole part came out too big! The pattern was adjustable for different sizes, but it didn’t work out. It’s too big in the armpit. Can this be fixed and how? If it can’t what a wast. Thank you for your help.